Wow I have just got the new Spectrum noir pencils from Crafters Companion. 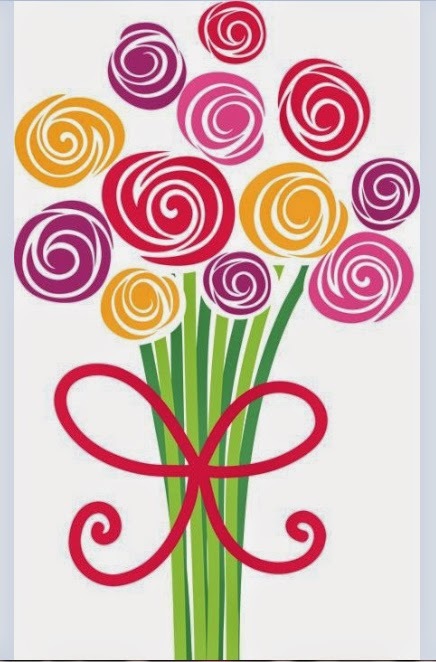 I have got two cards to share with you today. 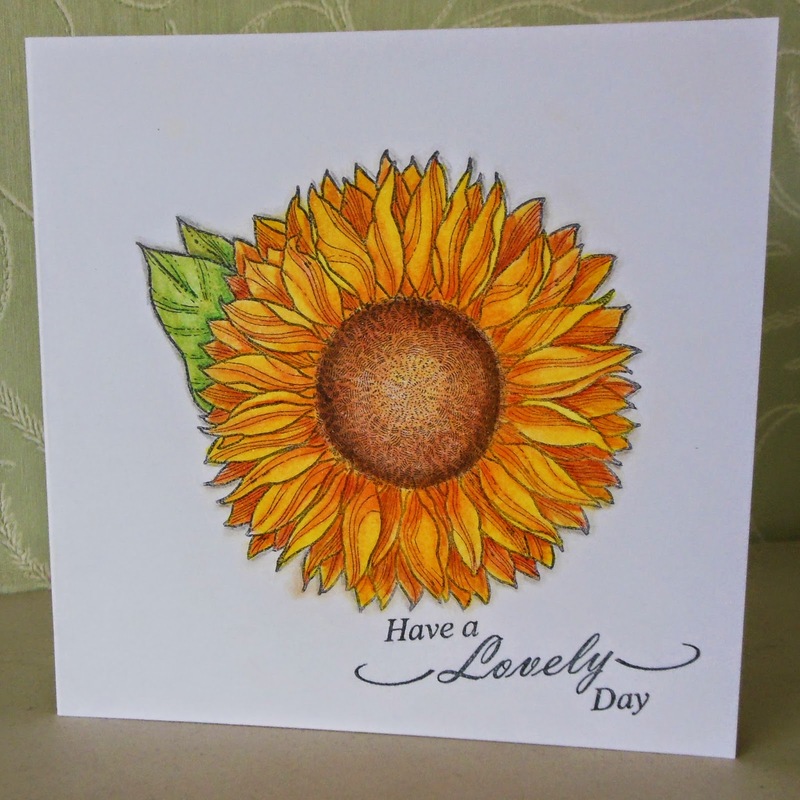 For the first card I used the sunflower stamp from Indigoblu . Normally when I colour something in I spoil it but I loved the results I got using these pencils. 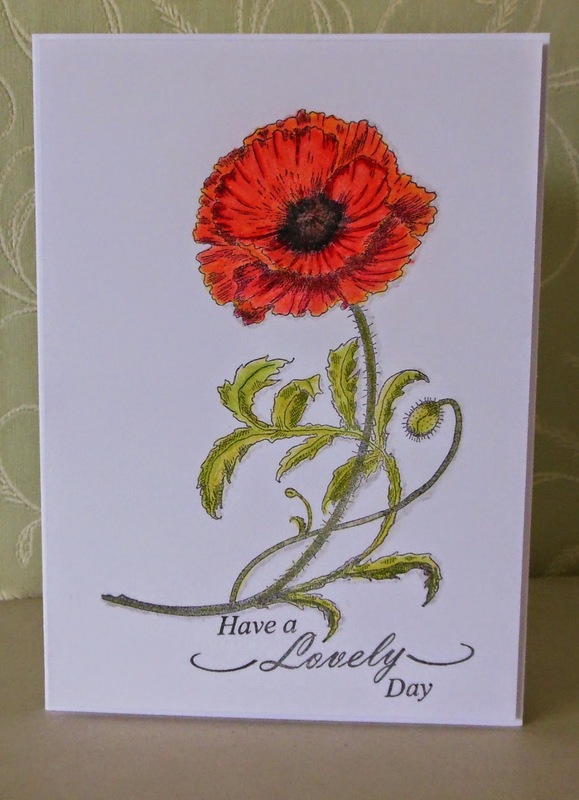 The next card I used the Ickle Poppy from Indegoblu. I don't consider myself a colourist. And I know there are some clever folks out there that are much better at this art but I was quite happy with my colouring in efforts for a change. That's all for this post. Thank you for stopping by. I will see you again soon. Now I've recovered from my bike ride last Monday. Let me show you what I have been up to this week. I think I've got stuck in a bit of a rut. 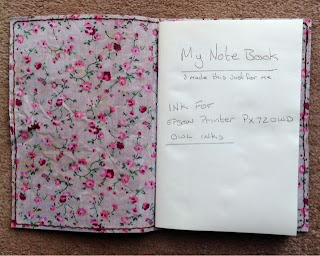 I'm still using the distress ink ''Peacock Feathers'' I just love the colour. 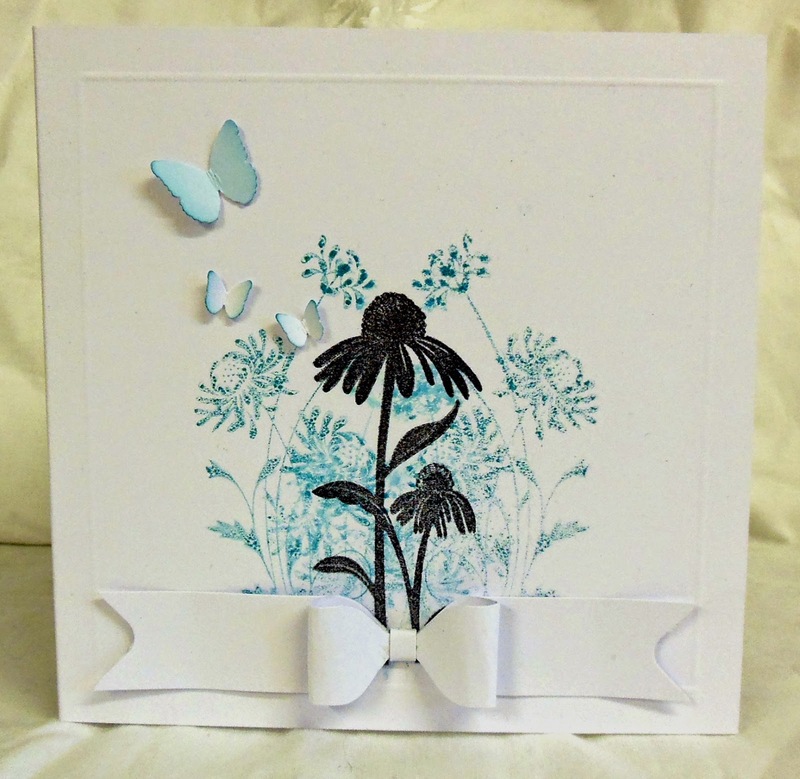 The stamp I have used is Silhouetts Flowers from Joy craft. 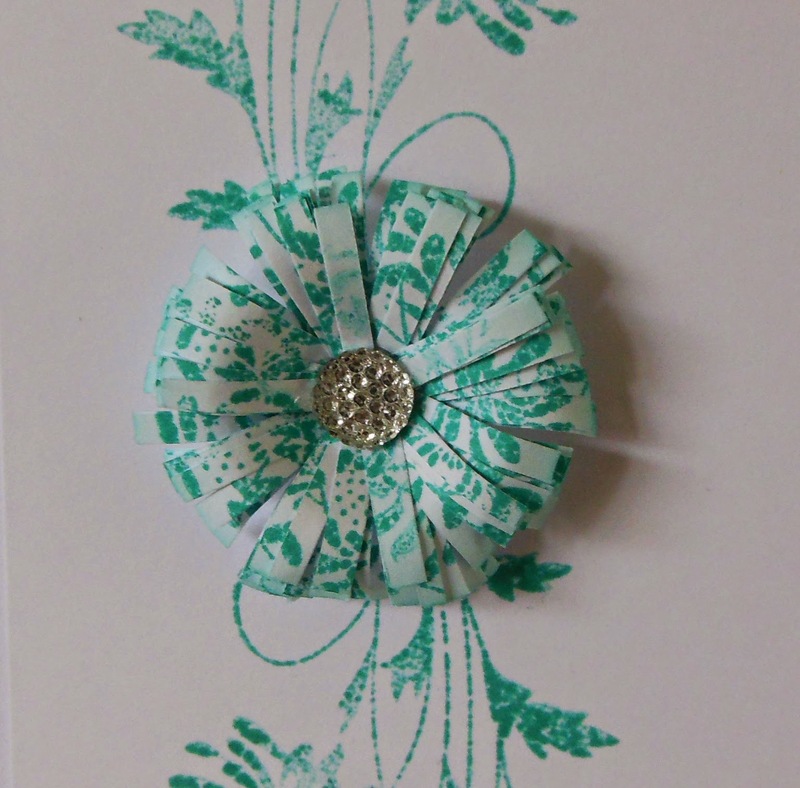 I've stamped it twice and made a quilled flower for the center. 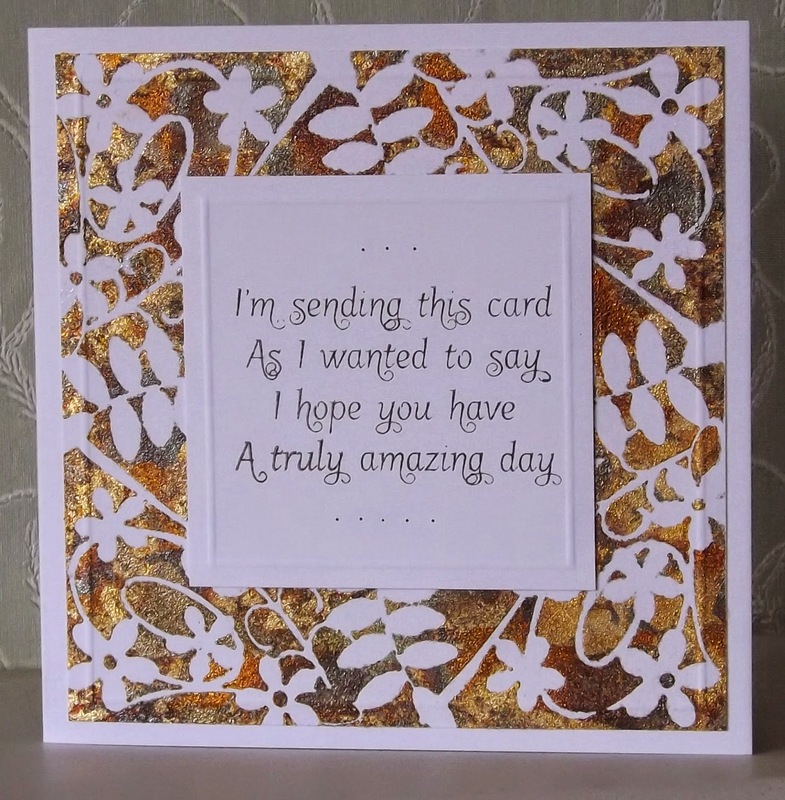 The sentiment is from a Creative Expressions set. The flowers are so easy to make. 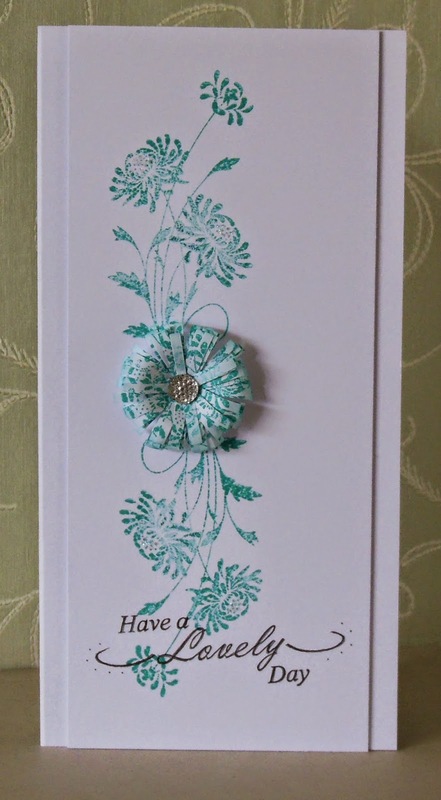 For this fringed quilled flower, I started with a strip of white paper 2cm X 29cm and stamped it with the stamp used on the card. I fringed the strip and then rolled it up with a quilling tool. There are some really good tutorials on You tube showing how to make these. 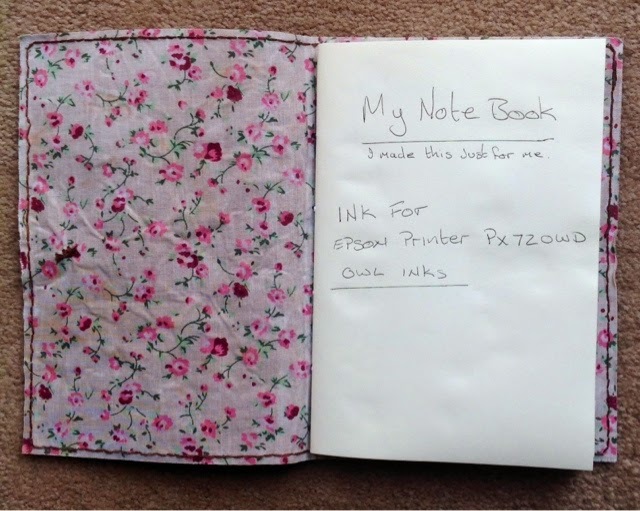 These are flowers are a great way of using up those papers that we have lurking in our cupboards that we don't like or don't know what to do with. Try cutting them into strips and make fringed flowers. You will get some fabulous results. That's all for this post. Thank you for stopping by. See you again soon. I hope you have had a lovely Bank Holiday. Mine was a bit tireing. I said I would go out on a bike ride with my husband, who loves going out on his push bike, me however prefer a good walk. We went with my friend and her partner who is another keen cyclist . It's my own fault I did volunteer.... Oh well, that will teach me. We cycled to the Attemborough Nature Reserve which is 17 and a half miles from where we live in Smalley, along the Nutbrook trail. There are some lovely views along the way, well worth the ride. My friend and I went along at our own pace and let the men race along at theirs. Every now and then they would stop and wait for us, we would catch up and they would set off again. We arrived at the reserve and I was surprised at my self, for someone that hasn't been on a bike since summer last year I felt ok ...... I can tell you the 17 and a half miles there where easy.....it's the 17 and a half miles back that where difficult. By the time I got back home I was cream crackerd......We had cycled 35 miles..... My poor little legs didn't even want to carry me upstairs to get a bath....... Anyway they did......just......I think I am going to ache a bit tomorrow. I did enjoy myself really and the reserve is well worth a visit. I better go and rest my weary bones. Thank you for stopping by . See you again soon. Here is my share today. I love how when you make one card an idea for another card comes to you. This card is a card that came to me after I had made the Shadow Stamping card. This card was my practice card, just to see how things would turn out. 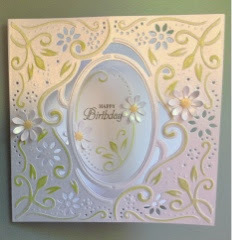 I was very happy with the mirror stamping but not with the overall card but as I said this was a practice. This isn't a new technique in fact it has been around for a log time and I have been meaning to give it a go for a long time but never got around to it. I love trying out different things. That's all for this post..... Thank you for stopping by. There's nothing like your blog going down to give you a wake up call. If you have found me again please leave me a comment to let me know . I'm feeling a little lonely here on my own again. Right onto today's share. ( if I'm not blogging to myself.) 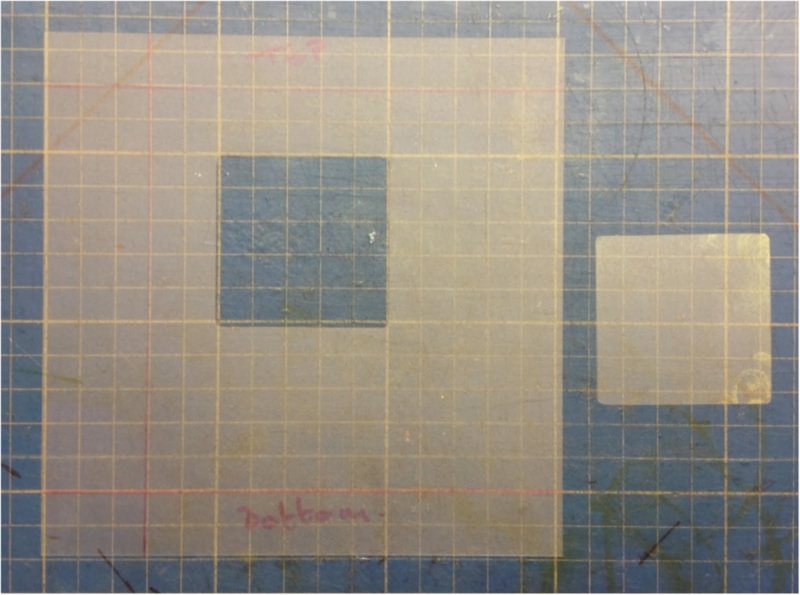 Which is Shadow stamping. I know there is nothing new here but I love the technique . 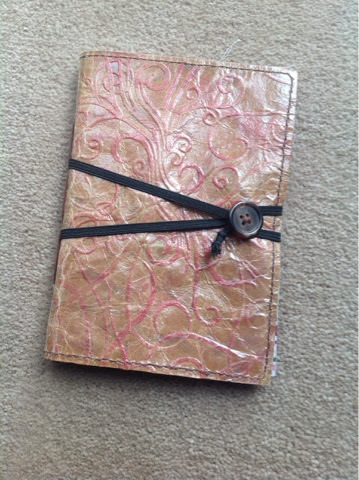 I stamped first with versamark then used clear embossing powder. I sponged over with my favorite Distress colour at the moment which is Peacock Feathers. Then stamped the image again with peacock feathers just off setting it a little giving the shadow affect. 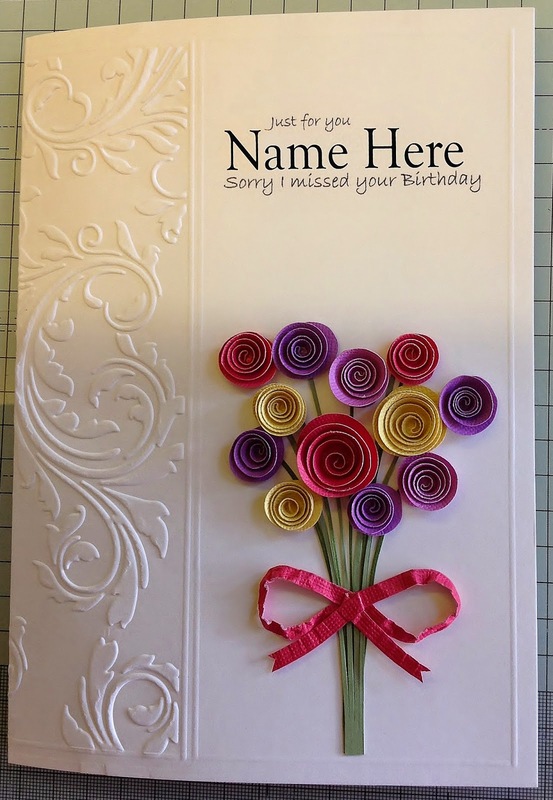 I keep thinking the card could do with something else on it but I can't make up my mine what.... Maybe three little gems in the top right corner.....It'll come to me at some point..... but until it does I will leave the card as it is. If I do put anything else on it I will post it. Ok that's all for this post., thank you for stopping by. 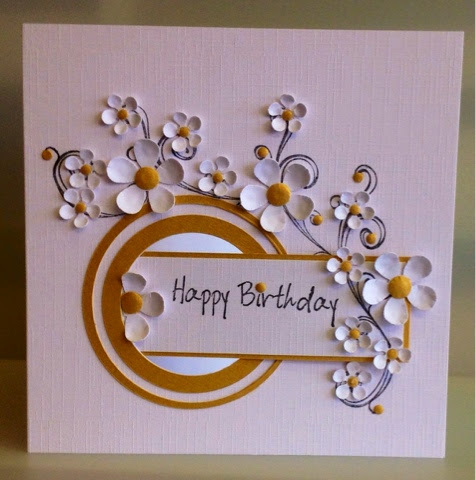 This little card took me back to the beginning of my card making. I used to use punches a lot in the early days, now I like to mix things up a bit. 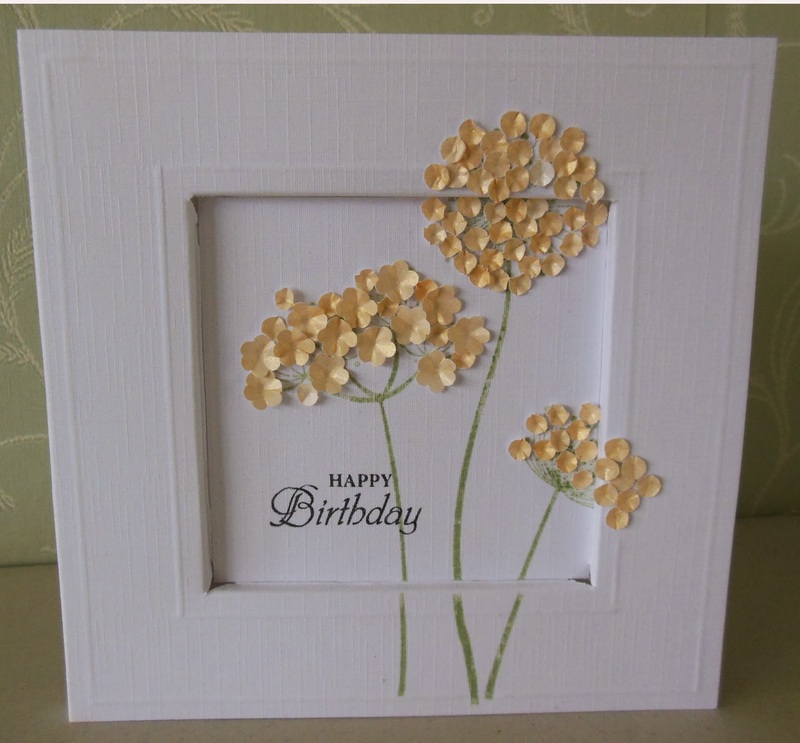 The punches used are Martha Stewart 3 in 1 Hydrangea punch and EK success Rock fern medium punch. 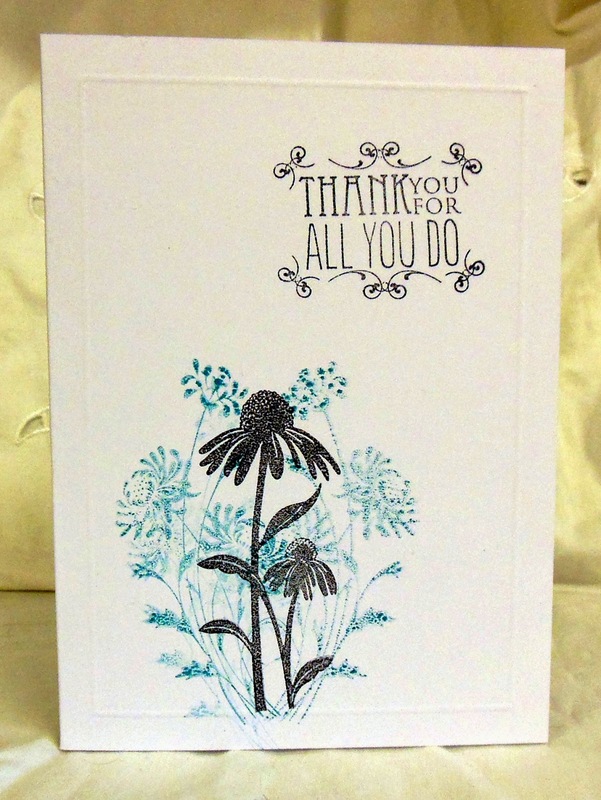 Other stuff used from my stash are a fine black liner , tiny sticky pearls , bundled sage Distress ink to colour spare card stock to punch the rock fern out of and bundled sage distress pen to add detail to the leaves. Well thats all for this post. Short but sweet. 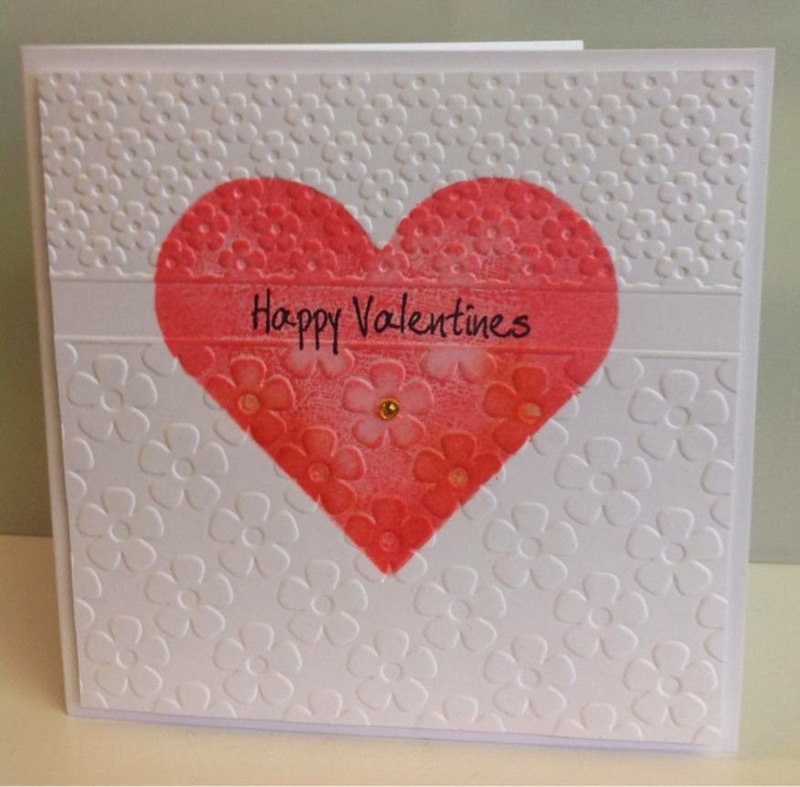 This card and the next few cards I have used the Easter egg stamp from Indegoblu . I stamped this one with versamark and used sticky embossing powder then used gilding flakes. I coloured the ribbon with Peacock Feathers distress ink. This one was just stamped with the Peacock Feathers distress ink cut out and mounted . 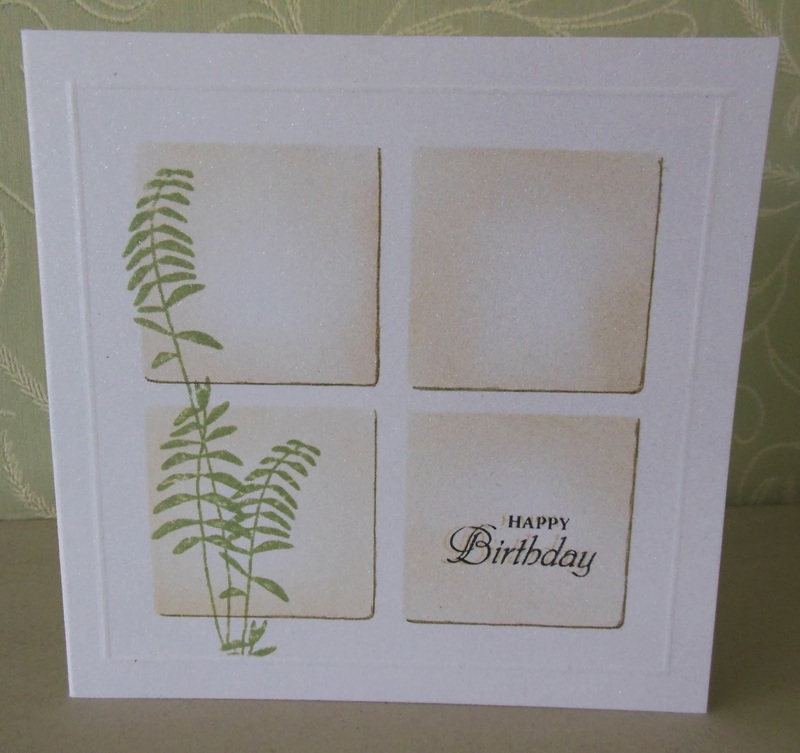 Now I wanted to get more use from the stamp so for this card I stamped the bottom portion of the stamp six times to make up the scalloped border. I used the top part of the egg here. I just love the Peacock Feathers Distress ink. 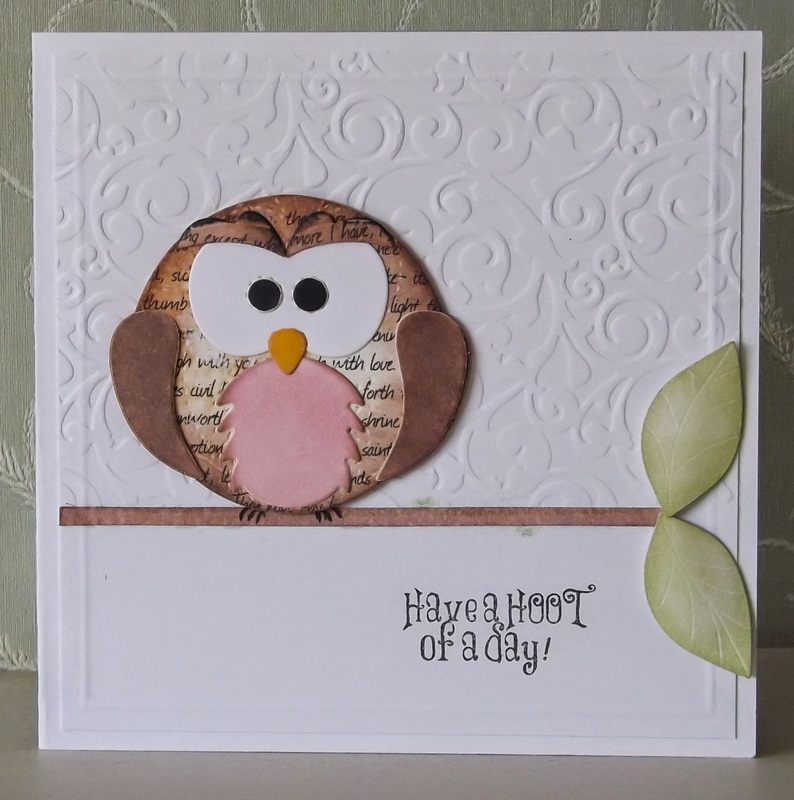 And the last card for this post, I used one of the spare stamped eggs that hadn't stamped out too well. 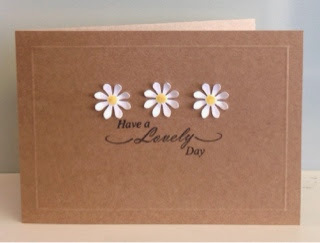 Using a retro flower punched out a couple of flowers and used them to make this little card. Well that's all for this post I will be back soon with another. Thank you for stopping by. Well I have been having all sorts of problems with my little blog. It's been down and out for a while. I didn't know about it until one of my customers told me that she was having trouble finding my blog. Anyway I'm back...... on the net that is... whoopeee. Now all I've got to do is get the blog visible again. These cards I made a few weeks ago. 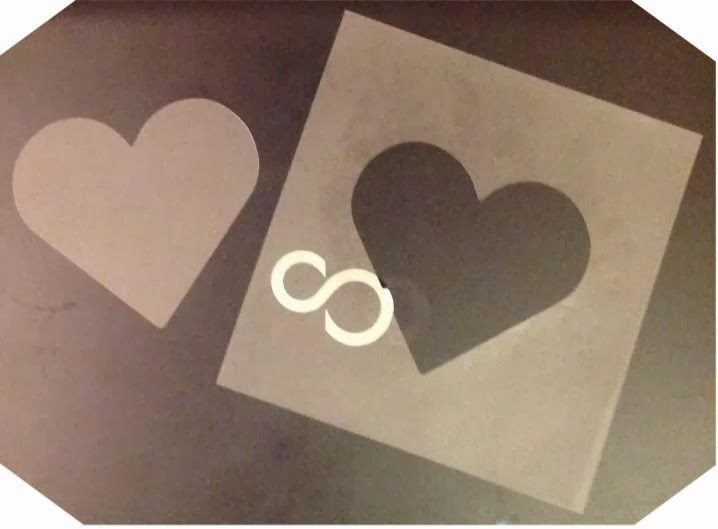 I had been experimenting with stencils I had made myself. 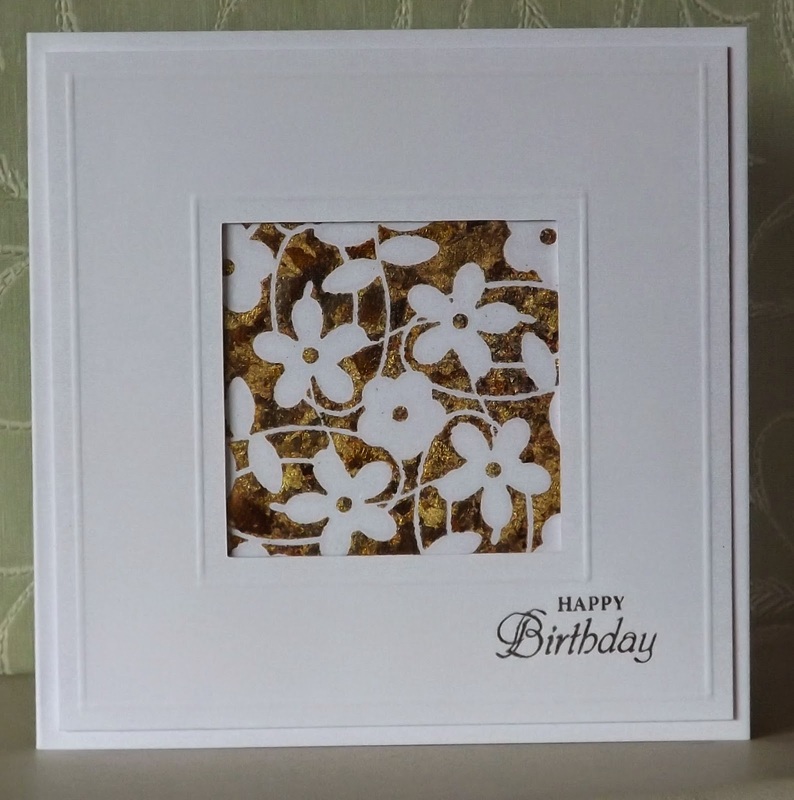 I love the versatility of stencils you can sponge, paint, spritz and stamp through them. 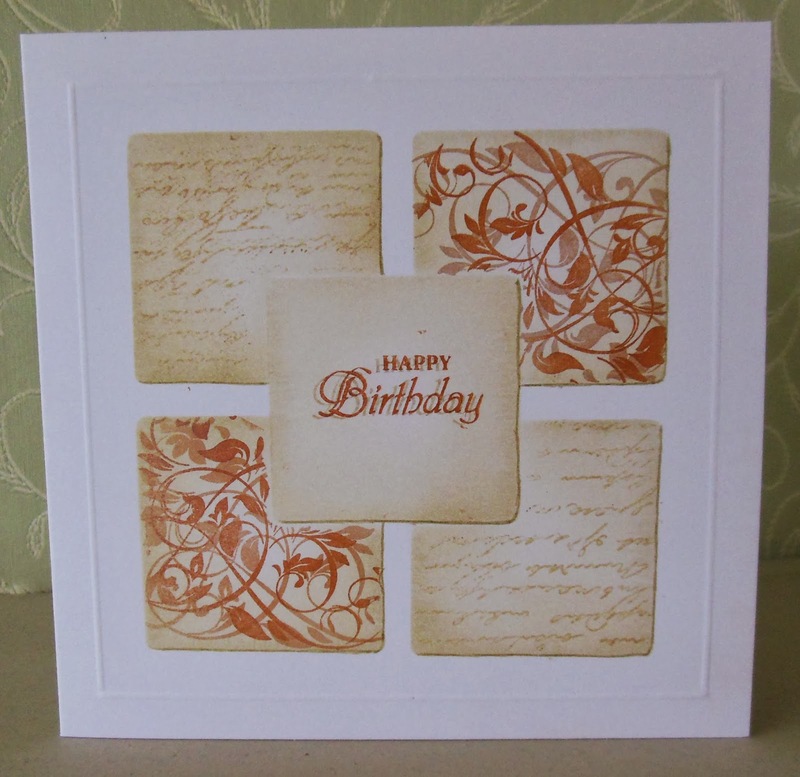 When stamping though them you can use any of you stamps to create all sorts of different possibilies. The two cards I have made here look very similar . 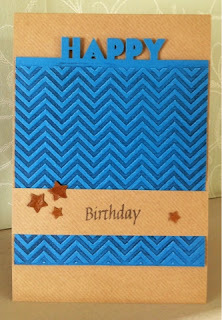 The card above is how I wanted the card to turn out. 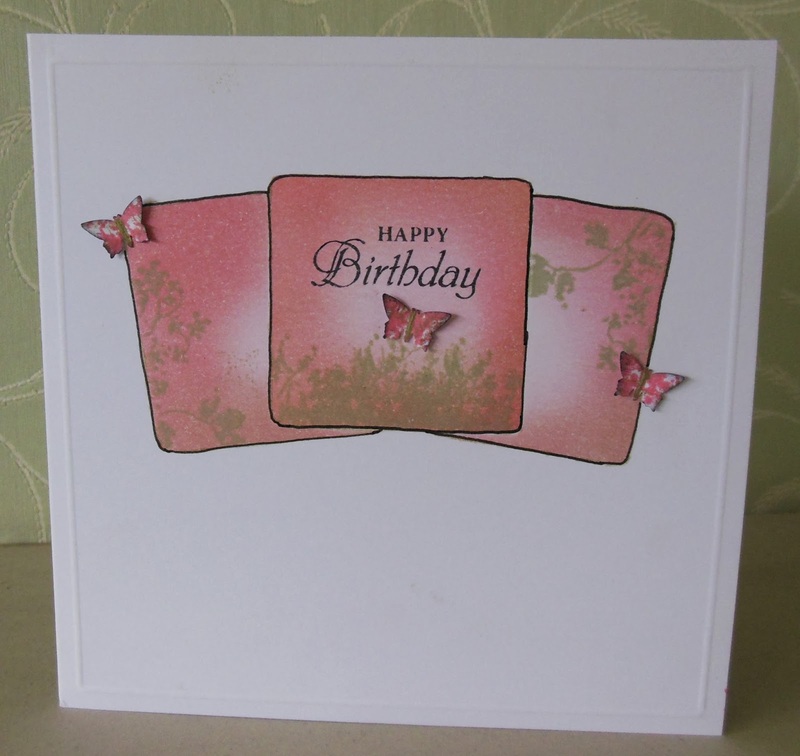 The card below is from one of my practices. The card had gone wrong but the guitar image had turnd out OK so I decided to cut it out and use it as a topper. I then masked off most of the c/s stamped it with a music background stamp and with a black fine liner drew a line top and bottom of the stamping, by some mirical the stamping on the card and on the guitar match up. I would like to say it was intentional ( is that a word ? ) but... It wasn't .... It was Just pure luck... Loved the result though. 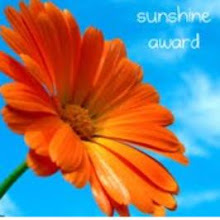 Well that's all for this short post ..Thank you for stopping by... I will see you again soon with another little creation. It's not very often these days I get time just to experiment and play, today was a rare opatuity to do just that. 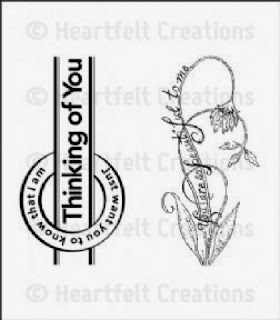 The card I am sharing with you to day has been inspired by a stamp from Heartfelt Creations, I saw a while ago. 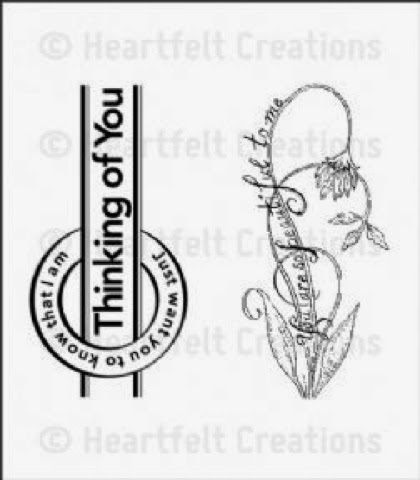 I loved the stamp but never bought it, it stuck in my head and every now and then it would pop in up in my head and I would think " I should of bought that stamp "
I started with cutting an apeture, then cut the rings, the banner then stamped the scroll flourish. Not sure at this point what I was going to do next, so I punch some flowers and played about with them until they fell into place. It feels as though the card made it's self really. With just a little bit of tweeking the card was finished. Now I can see why I didn't buy the stamp.........because I saw somthing like this in my head and just needed to make it. Well that's all for this post...... Thank you for stopping by........ I will be back with another creation soon.